History records that after his death in 1943, much of Nikola Tesla’s mysterious, enigmatic research was confiscated by the U.S. government and labeled TOP SECRET by J. Edgar Hoover. 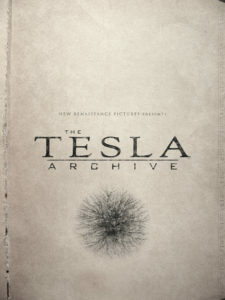 For seventy-five years, these classified documents have collected dust in an FBI vault, but now the Tesla Archive is about to be re-opened and the secrets held within will change the world forever. Within these classified files, Tesla created a comprehensive and detailed history, not of the past, but of the future. Every major world event post-1943: the Kennedy assassination, the moon landing, the September 11th attacks — and all of the events still to occur in coming decades . . .
Now, a covert division of the FBI has been given access to these files. Equipped with the knowledge of what is to come, this close-knit team will work to avert disaster and re-shape future events in order to create a better tomorrow. Contact us for more information, including a fully-developed series bible.